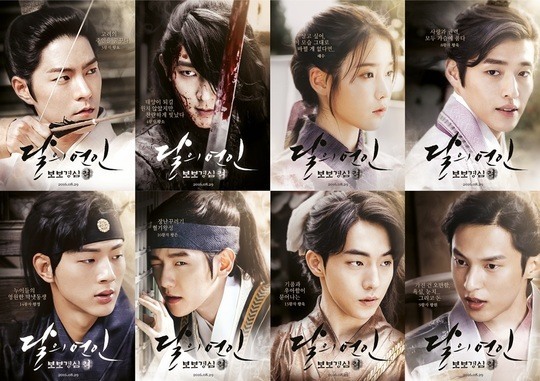 The posters depict the drama’s cast: actors Lee Joon-gi, Hong Jong-hyun, Nam Joo-hyuk, Kang Ha-neul, Kim Ji-soo, boy band EXO’s Byun Baek-hyun and female lead Lee Ji-eun, who is better known as the musician IU. Filming for the series ended three days before the posters were released and the title of the series was confirmed. The series revolves around a typical woman (Lee Ji-eun) who is sent back to the past whenever an eclipse takes place. A wayward Goryeo Dynasty prince (Lee Joon-gi) falls in love with her. It will air its first episode on Aug. 29.